Birth date and place 16 Jul 1828 Dromore, Down, Ireland. England, Wales & Scotland 45 Lower Wood Street, Woolwich, Kent, England (1861). 25 Catherine Street, Swansea, Glamorganshire, South Wales (1871). Physical Description Height: 5 ft. 9½ ins. Complexion: fair. Eyes: grey. Hair: light brown. 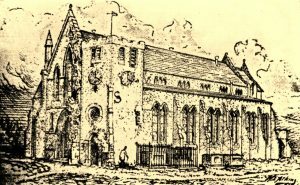 Marriage date and place 1st: 29 Sep 1858 St Mary’s Church, Portsea, Hampshire. 2nd: 1875 Fremantle, Western Australia. Spouse 1st: Eliza CAMPBELL (d. 1875, Western Australia). Robert James b. 1860, Woolwich, Kent. William John b. 1866, Gibraltar. Arthur b. 1868, Swansea, Glamorganshire, South Wales. Alice Mary b. 1871, Swansea, Glamorganshire, South Wales. Eliza Margaret b, 1876, Fremantle, Western Australia. William Henry b. 1878, Fremantle, Western Australia. Alice Maude Ethel b. 1882 Fremantle, Western Australia. Death date and place 31 Oct 1883 Convict Establishment (Fremantle Prison), Fremantle, Western Australia. Burial date and place November 1883 Skinner Street Cemetery, Fremantle, Western Australia. 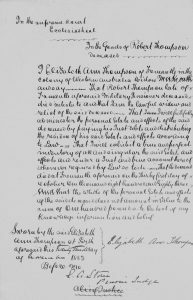 Will and Probate Letters of Administration 23 Nov 1883. Probate in the Supreme Court of Western Australia. Death Notices and Obituaries Daily News 1 Nov 1883. Inquirer & Commercial News 7 Nov 1883. The Herald 10 Nov 1883. Regiment No. and Rank #21716 Gunner & Driver. Attestation date and place 14 May 1846 Lisburn, Armagh. Service/Campaigns Canada 5 years 3 months. Musters 1851 London West, Canada [WO10-2070]. 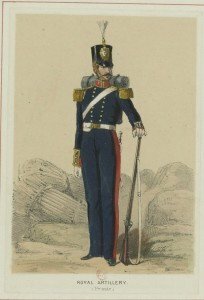 Promotions Gunner to Bombardier 19 Dec 1857. 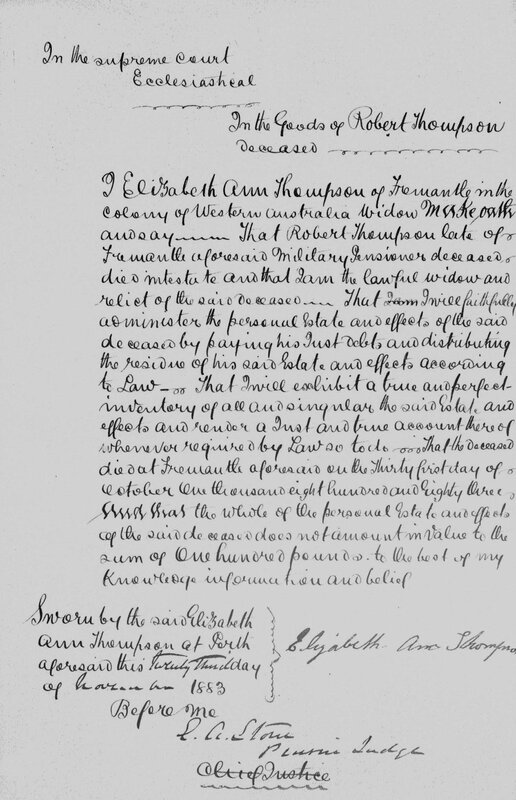 Bombardier to Corporal 13 Jul 1859. Corporal to Sergeant 8 Dec 1866. Regimental Courts Martial Awaiting Trial 17 Apr to 2 May 1850. Tried & Imprisoned 3 May to 13 Jun 1850. Awaiting Trial 6 to 7 Dec 1866. Tried & Reduced 8 Dec 1866. Sentence remitted. Entered 22 times in the Regimental Defaulters Book. Discharge date and place 3 Dec 1867 Woolwich. 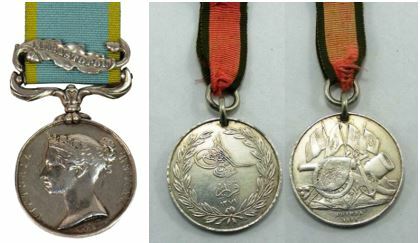 Length of Service 21 years 81 days (including Militia service). Post Discharge Residence Swansea, Glamorganshire, South Wales. Post Discharge Pension District Cardiff (1867). Greenwich (1873). Pension Amount 1/1½d. per diem. Increased to 1/8d. per diem on 28 Jan 1868. Increased to 1/10½d. per diem on 18 Jan 1881 for service EPF. 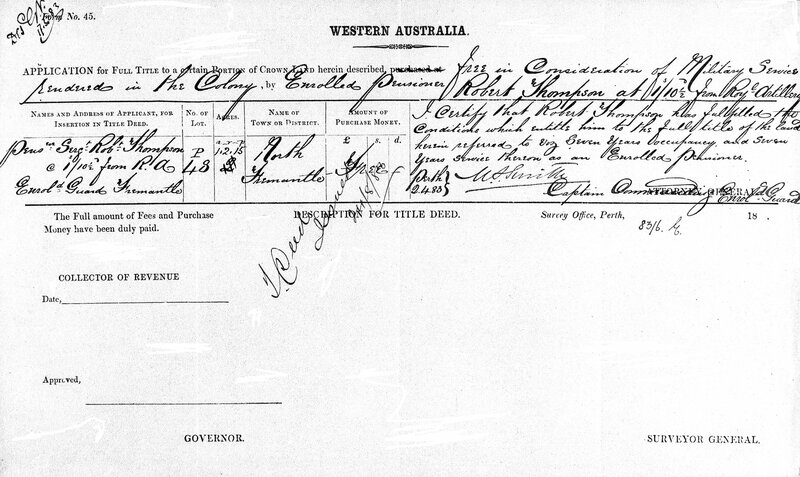 Enrolled Guard, Fremantle from 11 Nov 1880 until death 1883. 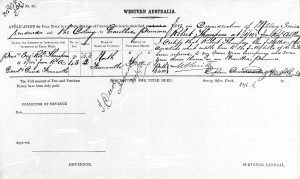 Land Grant/Purchase 24 Aug 1883 North Fremantle Lot P48 (grant). 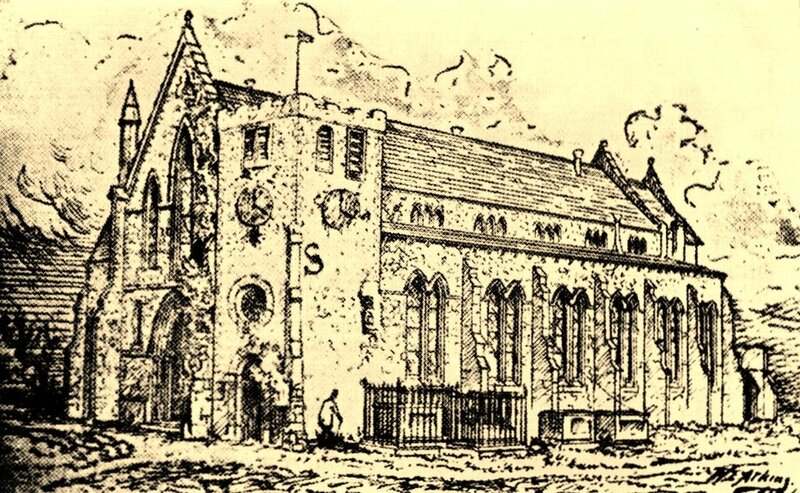 St Mary’s Church Portsea (1843-1889) where Robert Thompson & Eliza Campbell were married.